Hello everyone, I hope you are having a great week. I'm doing wonderfully. August is here. We have had great weather all summer, but this week it's been in the triple digits. I was outside early this morning to photograph this post. I started shooting in the sun and ended the shoot in the shade. It was HOT! Last year while in England I bought this adorable strawberry tea cozy at an outdoor market place. 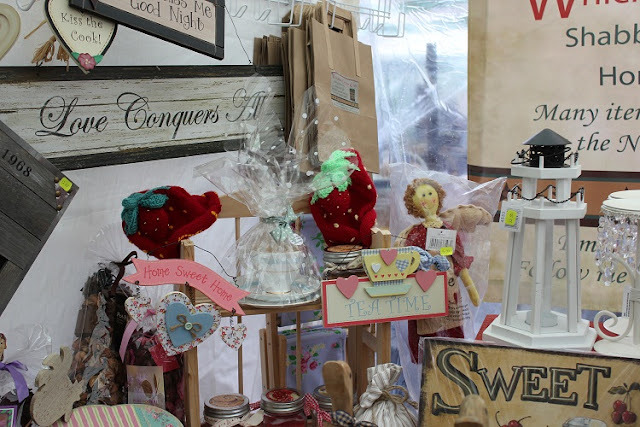 I found it at the Whickham Cottage Crafts booth in Durham, England..
Do you think I'm crazy showing off my tea cozy in the middle of the summer? I think I'm crazy! My post vision was to put fresh strawberries in the post, but every time I had some strawberries for the post, sweetheart and I would eat them up. So here is the cutest tea cozy at My Cozy Corner in the summer sun. The Black-Eyed-Susan's are blooming up a storm. The vintage table cloth I've had for awhile, and my vintage snack sets have been around since the early 60's. I still use them today for tea parties and family get-togethers. The tea cozy is covered with yellow seeds and the big strawberry on top. I used my red tea pot, but I think a bright yellow tea pot would be fun also. The knitted green top is amazing. And the beads for seeds are so cute. for an added glow to our patio area during the summer months. I found some vintage flatware at GW and the matching napkins I made years ago. There's always something to eat with a cup of tea. Last night I put ice cream, strawberries and whipped cream on this bread. It was a delicious treat. nice change from the traditional zucchini bread recipes I usually bake. Now we're in the shade. Thank Goodness!!! The vintage tablecloth has an embroidered strawberry pattern and motif around the edges. Some loving hands have touched this tablecloth and now I'm the proud owner of it. Lot's of summer yellow in the garden this time of year. Can you see my tea cozy just waiting for me to buy it? This was the cutest booth. I hope you have enjoyed my little treasures that I dearly love. I'm joining some fun parties, so hop over and see what's up. That is so darling. I have several vintage tablecloths with strawberries and love them too. That cozy is precious! I think your strawberry tea cozy is adorable and I'm going to write out the yummy recipe. Betty, I think I have a case of tea cozy envy!! OMGoodness, that is the cutest EVER!! I'm visiting from Rose Chintz Cottage. That tea cozy is simply adorable! I love it! How pretty all your Brown-eyed Susans are! Wonderful post and thank you for sharing with us. Your tablescape and tea cozy are adorable! Love your flowers....great spot for tea!! What a delightful and lovely garden tea! I adore your strawberry knitted tea cosy- just too cute!!! Hi Betty. Thanks for sharing your wonderful garden and your tea cozy. That is absolutely brilliant! I LOVE your cozy! And, as far as I'm concerned, it's always time for tea! Love your cozy! I can't believe that I didn't get one when I was over there last year! When were you there and where? We were there for six weeks and lived in Wiltshire and the Cotswolds. I adore England and brought home many treasures -- just not a tea cozy! I'd say a fresh strawberry is a perfect cozy for the summer. It really is adorable. What an adorable tea cozy and how fortunate for you to have visited England! Beautiful photos, thank you so much for sharing these. ***I am stopping by from the hop, A Return To Lovliness. Have a wonderful week! Greetings from Oman!! !That tea cozy is so cute...I just love it.Lovely blooms indeed. Have a gretag day! I love it. I hope I will find some treasures when I go home to England next week. What a darling teacosy! Your tea looks so lovely and inviting. Wish I could join you. Have a great week. Your clear glass party snack sets caught my eye - - - I have two of that same pattern!!! I also have two others that are a different pattern. I just used them to "entertain" my old HS girlfriends a couple of weeks ago. But the star of your table is definitely the strawberry tea cozy. You were so lucky to find that! My husband and I visited England in 1999; it was a fun trip. How did you enjoy your visit? Visiting you from Let's Dish -- hope you have a wonderful weekend. What an adorable tea cozy. It makes the table! What lovely setting! Love that red teapot cover. Cute tea cozy...♥ the yellow flatware. 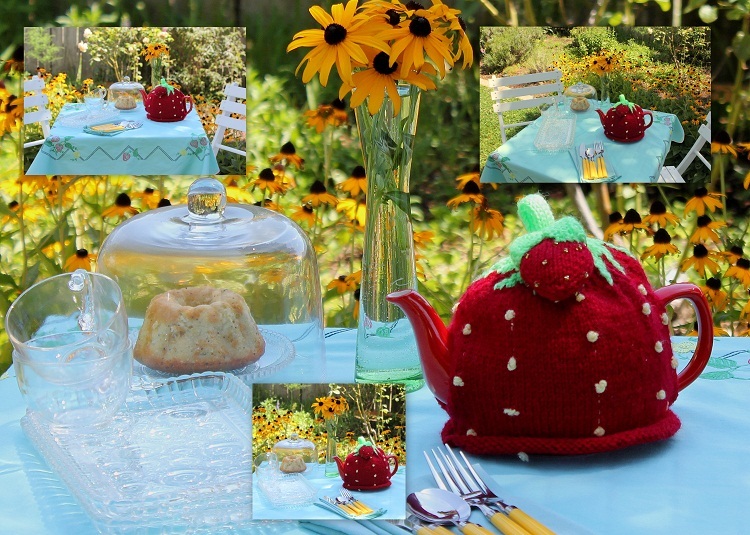 Lovely garden, a sweet table setting with the cutest knitted teapot cover! Happy Seasonal Sunday. That is an adorable cozy and does go so well with my strawberry table! Thanks for being a part of Let's Dish! How cute is that! Thank you for joining me at Home Sweet Home! That is so sweet! We are going to London in December so I will have to look out for a cute cozy too! Thanks so much for joining in with my Say G'Day Saturday linky party. I hope to see you again this weekend!